Join us to hear fresh ideas on how to eat more plant-based wholefood with Harriet Birrell, aka ‘Natural Harry’, a woman whose mission is to show people a different way to think about nourishing food. Birrell and Sharlee Gibb (co-author of Mr and Mrs Wilkinson’s How It Is at Home and the creator of Fully Booked Women) will share ideas and discuss Birrell’s new book, Whole, which contains more than one hundred plant-based, wholefood recipes that strike the perfect balance between whole, simple, satisfying and tasty. This event is organised by the team at Readings Hawthorn. As part of the Festival21 program, our founder Sharlee Gibb is hosting a panel discussion in The Forum amongst the 2-day celebration of all things food. What changes can we make in our home and community to promote using and eating good, honest food? We ask Stephanie Alexander, Julia Busuttil Nishimura, Emiko Davies and Silvia Colloca. festival21 is a free event. The Forum is non-ticketed, Places will be given to 'first in, first served'. Arrive early to secure your seat. Make sure you check out festival21 for the full program including many other women from the Fully Booked community like Alice Zaslavsky, Dianne McGrath, Miranda Sharp, Rebecca Sullivan, Sharon Flynn, Nayran Tabiei, Tammi Jonas and Bec Scott. Professional and home bakers alike are combining their creative food talents for an old-fashion bake sale at the upcoming festival21, a two-day celebration of all things food. Supported by the Fully Booked Women’s community, the delicious offerings on sale will reflect the much-loved cakes, biscuits and slices we have all grown up on. All monies raised will support the Sandro Demaio Foundation to develop new solutions to improve the health of all Australians through food. The Bake Sale will be held on Saturday 2 Feb, doors open at 10.30am until sold out. festival21 is being held at Meat Market, 3 Blackwood Street, North Melbourne, it is a free event for all. If you would like to get involved and donate some baked goodies for the day please drop us a line at sharlee@fullybookedwomen.com, we would love to have you involved too. Special thanks to our organising committee of Fully Booked Women for bringing this bake sale to life Sarah Cuthbert, Sonia Tysing, Glynis Smalley and Sharlee Gibb. In her new cookbook Special Guest, the brilliant Annabel Crabb has created the cookbook for when you want to welcome friends for a meal but your dining table is decorated with a pile of bills and homework rather than an artfully arranged bunch of flowers and homemade terrarium! Come along to hear Crabb and Fully Booked Women founder Sharlee Gibb (co-author Mr & Mrs Wilkinson’s How it is at Home) talk about how to turn easy, basic fare into something of a celebration. Tickets are $40 per person and include a signed copy of Special Guest. Please book here. This event is organised by the team at Readings. A day of storytelling, discussion and delectable food for book readers and food lovers. New event to our OffShoots Program is the wonderful Sydney food writers festival organised by Barbara Sweeney. Sydney’s Food and Words draws star chefs, gun writers and academics together for a day of food and book talks. The line up is, as always, inspiring. Amongst the speakers is first-time author Nadine Ingram of Flour and Stone (in a world exclusive, Nadine’s book will be available at Food & Words ahead of its general release); renowned food historian Barbara Santich; permaculture educator Kirsten Bradley of Milkwood; journalist Gabrielle Chan and photographer Rachel Tolosa Paz, whose latest book captures the food spirit of Argentina. What's included: 10 speakers, lunch and wine, morning and afternoon tea, all-day tea and coffee and a gift. Launched in 2014, the Women in Foodservice Charity Event is an intimate brunch that invites women in the food industry to come together and celebrate their knowledge. This unique event provides the opportunity to be inspired and influenced by key successful women within the industry while connecting and networking with your peers. All profits from the event are donated to charity. In 2018 the Women in Foodservice Charity Event will host a panel discussion covering all areas of the food industry. The panel will be facilitated by Australian journalist and food author, Dani Valent who will lead a discussion with renowned industry innovators including Sharlee Gibb, Shannon Martinez, Melissa Leong, Katy Barfield and Jo Barrett about their inspiring adventures in food. Featuring for the second time at the charity event is the Women in Foodservice Awards, run by foodservice magazine. 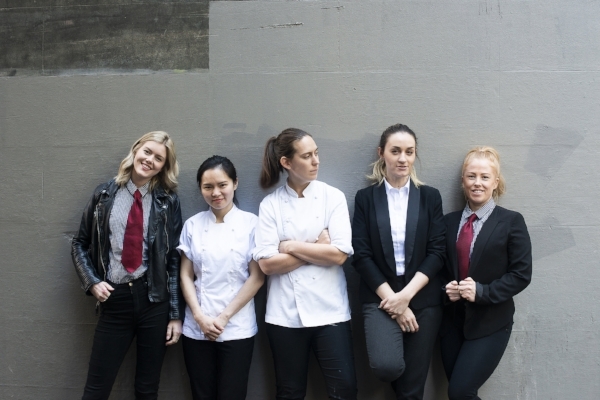 Proudly supported by Fine Food Australia, the awards celebrate women who through dedication, drive and excellence are doing their bit to shape and grow their business and the industry. The awards will be presented in six categories and are open to chefs, restaurateurs, venue managers, suppliers, distributors, waitstaff, sommeliers and the like. Winners will be judged by key industry identities – Christine Manfield, Jill Dupleix and foodservice editor Anita Connors. Sunday guest chef series hosted by Thi Le of Anchovy, menu collaboration with Emma McCaskill head chef of The Pot in Adelaide with an Anglo Indian vibe. Sunday guest chef series hosted by Thi Le of Anchovy, menu collaboration with Sarah Knights head chef of Automata in Sydney. The fourth instalment of Anchovy’s Sunday Series, this one dubbed ‘Laundry Day’, with Alanna Sapwell (Saint Peter), Jo Barrett (Oakridge Winery) and Lauren Eldridge (Stokehouse) at the helm. The chefs are having a good scrub at the problem of wastage so expect the glory of produce on the plate, from the fleshy bits to the fun bits through to the odd bits. Join us as the kitchen gets creative with the less alluring side of food prep – the off-cuts and the by-products. The Sunday Series at Anchovy gives an alternate voice to that age-old question – ‘What are we eating?’. From our socially constructed cultural identity through to practices in a post-industrialised economy that champions both self-reliant agriculture and reclaiming produce-specific waste, we are what we eat. Dani Valent hosts regular Restaurant Club dinners for her community. To celebrate truffle season, she has joined with the team at Massi Italian Restaurant for an exquisite evening. Prepare to be seduced by truffle-focused dishes, expertly paired wines from Italy and Australia and the opportunity to enjoy all this while learning more about truffles, a seductive, mysterious, prestige ingredient. Next in their Sunday guest chef series the team from Anchovy have invited head chef Imogen Czulowski of Africola to take over their kitchen. Africola is currently Adelaide’s restaurant of the year and they feature funky beats with an African-inspired menu of vegetables, grilled meats, flatbreads and pickles. This menu collab with Anchovy head chef Thi Le is going to be epic, Sunday dinner is sorted. As part of The Final Countdown before closing our doors on 24 June, we're thrilled to have Nancy Singleton Hachisu back by popular demand - one of Japan's most adored chefs and advocates of traditional Japanese food - to launch her new book, Japan: The Cookbook, published by Phaidon. Join Nancy and the Pope Joan family for a Japanese extravaganza! Think sake on arrival, soy pickled wasabi tops, chicken nuggets (yes, that's right), yakitori bits 'n' bobs, pork and napa cabbage, garlic rice and, to finish, steamed apple and sweet potato with soy ice cream, plus heaps more. Nancy's books will also be available for purchase on the night. It's Autumn and it's wild mushroom season. We have called in expert forager Jo Corrigan of Mushrooms Anonymous to show us what she has been finding on the forest floor this season. Eileen Horsnell, head chef of Lûmé, will be cooking up a shared menu featuring mushrooms in every course. Yes, even dessert! We are unable to cater to mushroom allergies for this event. Sorry guys this event is for women only. In collaboration with Nip of Courage, we are excited to announce a follow-up Women of Australian Distilling event: this time in Sydney hosted at Archie Rose Distillery in Rosebery. Meet, greet and taste with some of Australia’s most talented female distillers including Samantha Stefani (Archie Rose Distillery, NSW), Holly Klintworth (Bass and Flinders Distillery, VIC), Angela Andrews (Fleurieu Distilling, SA) and Genise Hollingworth (Black Gate Distillery, NSW). Tickets are $60pp and include an arrival drink, distillery tour, a spirits masterclass/tasting and snacks. Book here. In collaboration with Nip of Courage, we are thrilled to announce our first ever Women of Australian Distilling event: an epic night hosted at Starward Distillery in Port Melbourne, where you’ll have the chance to meet, greet and feast with some of Australia’s most talented distillers including Sarah Lark (Kangaroo Island Spirits, SA), Rebecca de Burgh (Margaret River Distilling Co., WA), Rachel Reed (Reed & Co. Distilling, VIC) and Genise Hollingworth (Black Gate Distillery, NSW). CAPI are helping out with the soft stuff, supplying a range of their mineral waters, mixers and fruit sodas, and Caroline Gray (A Bit of Jam and Pickle) is cooking up a fab Mediterranean-inspired meal to soak up the hard stuff. Tickets include dinner, drinks and a spirits masterclass and tasting. Sorry guys this event is for women only. Join us at Pope Joan for a night to celebrate the Women of Oakridge. Star chef Jo Barrett leads the team with her creative twist on local produce and repurposed foods. They are embracing the power of the fire using the wood grill in the courtyard for the night. Joining her in the kitchen are Oakridge chefs Sammy Butler and Louise Daily. Wine service will be led by Bec Webb and front of house we have Annie Colgrave, Stacey Fitzmaurice and Simone Berner. To round the night out we have Oakridge Wines director Ilana Atlas also joining us to chat about women in business, decision making and smashing glass ceilings. Tickets include dinner plus wine from Oakridge Wines and Amble. We are hosting our first Brisbane Fully Booked Women event in partnership with Julie Tjiandra of Scrumptious Reads. Come spend a couple of hours with us, connect with like-minded peers in the food and drinks industry, listen to some fab speakers, enjoy cheese from Fino Foods, a shared pot dinner by Danielle Dixon (sous chef, Bucci) and sip drinks curated by Penny Grant (sommelier, The Ghanem Group). We are delighted to welcome guest speakers Vanessa Pollock (Vanessa Pollock Training & Development), Brenda Fawdon (Real Food School) and Ash McLeod (Alfreshco) to share stories of their careers and how working in hospitality doesn't just mean working in a restaurant. The world is your oyster. Come and join the fun. A special evening to introduce you to the world of Japanese Ferments led by fermentation revivalist Sharon Flynn of The Fermentary. Sharon will chat to us about sake lees and its uses plus the magic of koji rice. We also get to mash our own miso to take home and ferment. Following the workshop will be a shared dinner cooked by chef Vicky Symington (Loafer) featuring loads of fermented goodies. Sharon is about to release her first book Ferment for Good (Hardie Grant), it will be available for purchase on the night. Numbers are limited, if you are at all interested in fermented foods this is the night for you, don't miss out! Lunch with Emiko will be held upstairs at Gertrude Street Enoteca in Fitzroy. The fabulous Brigitte Hafner, chef, farmer and food writer will be cooking dishes from Acquacotta to suit the mood and the season. After lunch Emiko will share stories of living in Tuscany, writing books and cooking followed by a Q and A, so if you ever wanted to know about the world of food writing, publishing and recipe writing this is the event for you. It's our last Fully Booked event of the year and a BIG celebration. Come join us to toast in the summer months with an Indian inspired menu cooked by Laura Neville (The Wandering Chef/Keralas Ways), Laura Morgan (Babajan) and Kay-Lene Tan (Tonka). And spices from Lucy-Ann May (The Hidden Souk). Our fab guest speaker on the evening, talking about our personal and professional Footprint, will be Alicia Darvall executive director of B Lab in Australia. Each chef is cooking a couple of dishes each plus we will have wines by Avani and rose by Holly's Garden. Advise dietary requirements prior to the event. Please note the dinner will be shared tables. These two kitchen queens were last seen on the pans together at Christine Manfield's Universal restaurant in Sydney in 2013. Christine now manages diverse culinary projects including pop up events, mentoring, writing books, teaching and taking food tours around the world. Thi Le is at the helm of one of Melbourne's hottest restaurants, Anchovy. It is our pleasure to bring them back together for a night of inspired cooking. There will be a bit of hot and sour, lots of salt and sweet and plenty of good times in Anchovy's newly refurbished dining room. Wines from Sutton Grange and a cameo on the floor from Liz Carey. Dinner will be snacks and three courses plus wines. Advise dietary requirements prior to the event. Please note the dinner will be shared tables with some seating on high stools and backless stools. We have turned the tables for this dinner...Meira Harel, restaurant manager of The Town Mouse and current The Age Sommelier of the Year made a list of Victorian wines made by female winemakers that she loves. Then we asked the winemakers Sally Belford (Bobar Wines), Tamara Irish (Enigma Variations) and Belinda Thomson (Crawford River Wines) what dish would they cook with their wine. To pull it all together the kitchen team at The Town Mouse will cook their interpretation of the dishes and we will, of course, drink the wines too. Dinner will be 3 courses with matched wines. Please advise dietary requirements prior to the event. Please note all seating is on high stools at shared tables. A great opportunity for young women in the industry to hear about life in the kitchen from the legendary Stephanie Alexander. Stephanie will chat about her career... running successful restaurants, writing 16 cookbooks including bestseller, The Cook's Companion and founding the Stephanie Alexander Kitchen Garden Foundation which now operates in over 800 schools across Australia. Lunch will be two courses, served in the garden room at the fabulous Pope Joan in East Brunswick, cooked by chef Vanessa Mateus and the team. DeBortoli are kindly providing wines from their La Boheme label.